2018 has blasted by in a flash! The last few months have been a whirlwind, and I realize I’ve fallen a bit behind with my blog. With this update, I plan on catching up on a few of the projects I’ve scored that have come out this summer, and I will look ahead at what is over the horizon for the rest of the year. 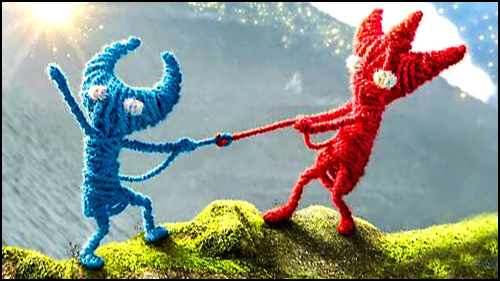 First up, I was thrilled to collaborate with singer-songwriter AURORA to produce a Celtic-inspired version of her track “Queendom Come.” The single was used by Electronic Arts for the official E3 reveal trailer for Unravel Two. Last spring, I got a call from my friend Steve Schnur at EA who said that the marketing team really loved this particular AURORA song, but wished it had a more acoustic, even Celtic, sound. Somehow, Steve thought of me as someone who might enjoy doing music in this style! I listened to her song and fell in love with it immediately. The harmonic progression was satisfying, the melody and vocals were haunting, and the lyrics were nostalgic and moving. I knew right away I would have a blast working on the track. The more I worked on “Queendom Come,” the more I fell in love with it. Though I admired the detail in her production, I was drawn to the challenge of completely rebuilding her instrumentation from scratch. So, I set aside every audio stem except for her stunning vocals. I began with a small Celtic ensemble (guitars, fiddle, bagpipes, whistle and bodhrán) and added lush orchestral strings and bigger percussion, giving the song a cinematic weight and warmth that I felt supported her powerful voice. I had fun with some of the smaller musical details. AURORA’s song is energized by an arpeggiating synth piano, that echoes and bounces in sixteenth notes, providing an elegant rhythmic intensity. This beautiful electronic effect can be challenging to recreate in acoustic music. So, I made it my quest to figure out how to do it! The Celtic harp is the closest sound to that synth texture, so I started by arranging a complex, but repetitive pattern that the harpist could master, and reliably play throughout the song. I then added acoustic guitar and dulcimer for sporadic splashes of variation. The combined effect recreated the vibrant, sparkling electronic sixteenth notes in an acoustic setting. I spent a long weekend immersed in the musical world of this track and it always put me in a good mood to work on it. I overheard my little girl singing the song to herself while she played with her dolls on more than one occasion, so I knew it must be working. After AURORA, Glassnote Records and EA gave the track a conceptual thumbs-up, we tinkered with the mix and structure to make it fit the format of the trailer that went online. I absolutely love arranging and producing tracks for other artists, or re-imagining their works. Free from the pressure of having to craft a melody or lyric, I skip to the fun part: throwing together sounds and colors. Like my arrangements of “All Along the Watchtower” for Battlestar Galactica or “Samson and Delilah” for Terminator: The Sarah Connor Chronicles, “Queendom Come” gave me the chance to take a brilliant song, and change it into something new. I am very proud of the result of our collaboration, and I hope that fans might have the chance to hear the song in its entirety one day. Thankfully, this won’t be my last chance to take a song and twist it into a new version. There’s another song on the horizon that may be the weirdest, loudest, most daring cover I’ve ever produced. More on that… in the future. Last June, Tau, my second Netflix feature, was released on the streaming platform. 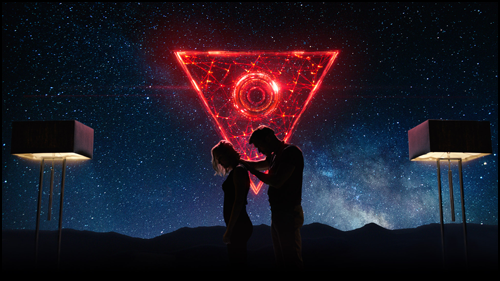 The science fiction thriller is about a young woman named Julia (Maika Monroe) who is kidnapped by a malicious tech billionaire named Alex (Ed Skrein) and held hostage in his home, to help train his greatest creation, an AI named Tau (voiced by Gary Oldman). I had a wonderful collaboration with visionary Marvel animatics artist and first-time feature director Federico D’Alessandro, and my dear friend David S. Goyer, who produced the film. Beneath its genre thriller surface, Tau is a character piece, the study of a relationship between a captive young woman and a childlike AI. Tau begins the film as a formidable presence, and gradually reveals an innocence as he forms a bond with Julia. Their relationship was my creative inroad to the film. Late in the film, Tau uses music in a pivotal scene to show Julia, and the audience, he is capable of creation. So, it was clear immediately that Tau and Julia would require a memorable theme, and that this theme would require two distinct components, one for each character. Tau is a computer program, so I knew I could use electronic music to provide the expected sounds one might find in a science fiction film. Instead, I gravitated towards an acoustic instrument capable of quick arpeggiations and ripples: the piano. Tau’s Theme gradually increases in dexterity and complexity over the course of the film. From the start, the piano is masked in layers of digital effects including distortion, reversal, delays, and other audio mangling. As Tau becomes a warmer character, these effects are gradually stripped away, until the acoustic piano becomes clear, capable of expressing on deeper emotion. This piano figure was, in essence, a musical representation of the electronic machinations inside Tau’s digital mind, and it forms the backbone of the score. Julia’s Theme is the opposite of Tau’s Ostinato in every musical way. Instead of being built from fast, repeating figures, her melody sighs with long, sustained tones. Instead of portraying childlike innocence, her theme has a sadness and hopefulness that only comes from life experience. Throughout most of the film, we hear snippets of Julia’s Theme. As her relationship with Tau forms, it collides into the Tau Theme until they essentially become one. The first true formation of their themes occurs when Tau composes a piece of music for her. His piano starts with singular distorted notes, that increase in activity until they form an impossibly fast arpeggio that could only be played by a computer. Atop that gorgeous texture, the solo violin expands into a lush string orchestra introducing a soaring statement of Julia’s Theme. This was my favorite scene in the film because it blurs the line between source music and score. Technically, the piano notes the audience hears are also being heard by Julia. Tau is synthesizing them, and producing them via his speakers. However, as the sequence builds, we hear orchestral strings, which give the audience a bolt of emotion. Is Tau creating the orchestra for Julia as well? Or are the strings a score layer for the audience that we’ve added on top of Tau’s piano? I honestly have no idea, and I frankly don’t even care, because the scene was so beautiful and inspiring. Like any project of this scope, producing and delivering a score is a massive team effort. I want to give a special shout-out to everyone on my team at Sparks & Shadows, especially Omer Ben-Zvi, Sam Ewing and Jason Akers for contributing additional music. Gratitude goes out to all my musicians, especially the talented string ensemble assembled by James Fitzpatrick in Prague. With Tau, I had a fantastic experience collaborating with great storytellers, and exploring a strangely beautiful relationship between a human and an AI. This film’s theme is one of the most beautiful I’ve ever written. I’ve seen a great deal of chatter online about getting a soundtrack album release for Tau, and I would love to see that happen one day. In the film, Ryze collects powerful Runes, at least one of which seems to possess the capacity to wreak terrible havoc upon the world. Through a painful flashback, we witness the devastation unleashed in Ryze’s past, as he failed to prevent this power from being properly contained. “Call of Power” elegantly depicts a man racked by guilt, and determined to do the right thing in the future. Before composing, I had extensive creative conversations with Jay. In my frequent visits to Riot Games’ sprawling campus in west Los Angeles, Jay and I spent as many hours going over this five minute film as we would have a two-hour feature. This investment of time was vital, because I had a lot of catching up to do. I needed to understand the background information about the world of League of Legends, and context for Ryze’s character. The more that Jay and I discussed story, the more we uncovered deeper layers of narrative subtext worthy of musical commentary. The Ryze Theme is the first and last thing heard in the score, and is woven throughout the musical fabric in nearly every scene. The theme’s simple construction allowed for it to be emotionally diverse, effectively supporting mystery, horror, longing and action. “Since this piece didn’t have any dialogue, but rich character performance, I wanted the music to almost act as another supporting character,” Redd told me. “Or perhaps [the music is] another of Ryze’s voices – the music holding the role of what we might do in cutting to a reaction shot. Despite the film’s short running time, we all understood from the outset that the score’s production needed to rival any feature film in musical scope. Riot budgeted for a massive ninety-piece orchestra, to be recorded at the Fox scoring stage in Los Angeles. Producing a score like this for a short film was a technical and logistical challenge. Thankfully, my team at Sparks & Shadows had immeasurable support from Paul Lipson and his team at Formosa Group / Interactive, with whom we collaborated to create the music and sound for “Call of Power.” I would also like to give a special shout out to Jason Akers from my team, who contributed additional music, and to Peter Rotter for assembling a world-class orchestra. Conducting this orchestra was a joyous experience. All the Los Angeles musicians were curious, excited and grateful to take part in this unique piece. I was especially impressed with the loose, rubato solos from the woodwind section, and the power of the horns and low brass in the score’s louder moments. As one can see from the video above, the highlight of the entire experience for me, however, was sharing the podium with my four-year-old guest conductor, Sonatine. She used to simply stand on the podium in front of me, but now she’s so big that she sat down on the chair next to me, and waved her baton as we powered through some of the cue’s more challenging sections. After the session, I overheard her walk over to a score laying on a table in the control room, point at a bar and proclaim to everyone around her that “this was the part I conducted!” I hope her curiosity about this experience continues to grow. The film we made has been viewed millions of times by fans around the world. 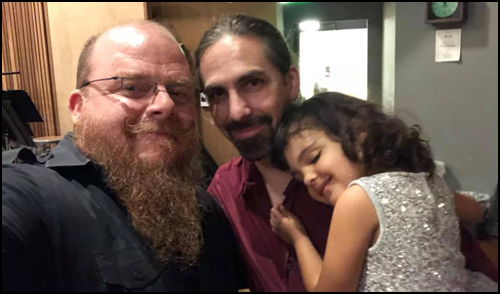 I am grateful to Jay Redd, and everyone at Riot Games, for giving me the chance to contribute to the vast world of League of Legends. I know that blogs have been slowing down, and I can just assure you all that is because I’m working on tons of new music to share with you all soon. Thanks for your patience with me! I wish I had as much time to blog as I used to, but I’ll try to keep up more frequently. As always, I appreciate everyone who listens, reads, and follows along with my crazy journey in music.